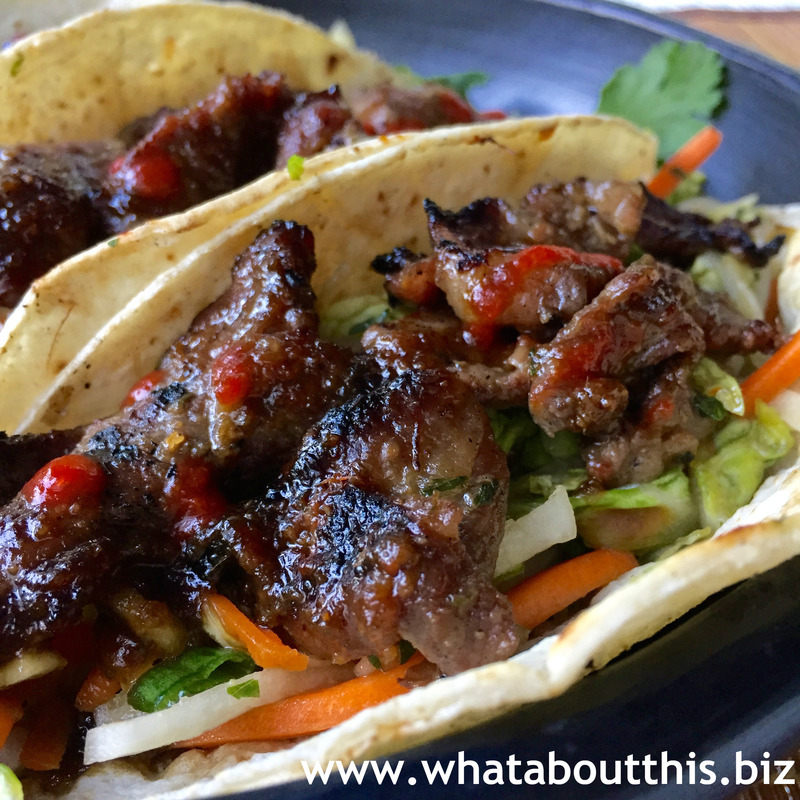 Korean Bulgogi Taco Recipe | What about this? Tender pieces of grilled Korean bulgogi on top of a spicy slaw and wrapped in a soft corn tortilla, exemplify fusion cuisine. Sriracha sauce replaces taco sauce. Taking a favorite Mexican dish and reworking it with Asian flavors, yields a mighty tasty combination. You might even say it’s “Seoul food” at its very best. 1. Cut off any excess fat from the short ribs then thinly slice the beef and cut into 1½-inch pieces. Place in a large bowl or in a plastic resealable bag. 2. In a blender or food processor, blend the soy sauce, mirin, sugar, sesame oil, garlic, scallions and ginger. Pour half of the sauce over the short ribs, ensuring all the beef is covered. Seal tightly and marinate the short ribs in the refrigerator for at least 3 hours and up to 24 hours. 3. Place the other half of the marinade in a pan and reduce over medium heat, stirring occasionally, until the mixture is thick. Place in a serving bowl and reserve to drizzle on the tacos. 4. For the slaw: Place the cabbage, daikon, cilantro and scallions together in a medium to large bowl. 5. For the dressing: In a small bowl, whisk together the lime juice, soy sauce, mirin and Sriracha. Slowly whisk in the olive oil. Place the dressing in the fridge until ready to use. 6. For the taco assembly: Heat your griddle to high. Flash cook the meat while simultaneously caramelizing the marinade. Place your short ribs on the griddle. Cook for 2 to 3 minutes and flip. Cook an additional 3 minutes, then wrap the meat in foil and set aside. 7. Grill up your tortillas. Flip after 45 seconds. Grill for another 45 seconds and remove. 8. On the grilled tortillas, pile some Korean slaw, dressing, beef, reserved and reduced marinade and extra Sriracha to taste. 1. This is not a difficult recipe to make, but it does take some time to prepare all of the components. To make it easier, next time I will marinate the meat in store-bought Korean B.B.Q. Sauce. Not only will this be easier, it might also make it less salty. 2. For several years now I’ve tried to watch my sodium intake. When I dine out, most food tastes salty to me. This recipe falls in that category. Other than the soy sauce there is no additional sodium added in the recipe. It would be difficult to cut the amount of soy sauce down, because the ratio of marinade to meat would not be correct. Perhaps the remedy would be to use a low-sodium soy sauce. 4. I added shredded carrots to the slaw for color and more daikon sticks for added crunch. 5. The recipe says to add the dressing while assembling the tacos. Dressing it as a salad before hand will cause the cabbage to become limp. 6. My husband grilled the meat outdoors on his barbecue.